This quilt is going to look familiar because it is made from one of my favorite patterns. I make it from scraps and boy do I have a lot of scraps! This time, I chose FabuLux Meditation thread. It's a blend of olive, tan, and gray and I hoped it would appear neutral on the black fabric. I think it worked! I love how this quilt turned out! This quilt doesn't have a forever home yet, but I'm sure I'll find one for it soon! New Cutie Pattern -- Summer's End! This quilt is 80"x92"and will eventually live on my bed; it needs to travel a bit first, though. I used Victoria Findlay Wolfe's Mostly Manor fabrics because they are happy and bright. I had been saving these fabrics for something special and I think they've found the perfect home in this quilt. I really, really wanted the star points to stand out on this quilt. I left them unquilted so that the batting would puff them up. I also quilted diamonds into the sashing to emphasize and elongate the star points. I wrote a short tutorial about how I marked the white fabric to quilt this sashing. I'm already hard at work making another copy of this quilt with some April Cornell fabric. Stay tuned for more photos! This summer, I opened up a beloved fat quarter pack of Pat Sloan's fabrics and have been slowly sewing my way through it ever since. Oh My Stars! Bedspread, currently on my bed! I made the border scrappy because I didn't have enough of any one fabric for a solid border. I think that the scrappy border totally makes this quilt! I was testing out a new-to-me thread, Master Quilter from WonderFil. It worked GREAT! Expect to hear more from me about this thread. I still have fabric left, so expect to see even more projects!!! New Cutie Pattern -- Go With The Flow!!! 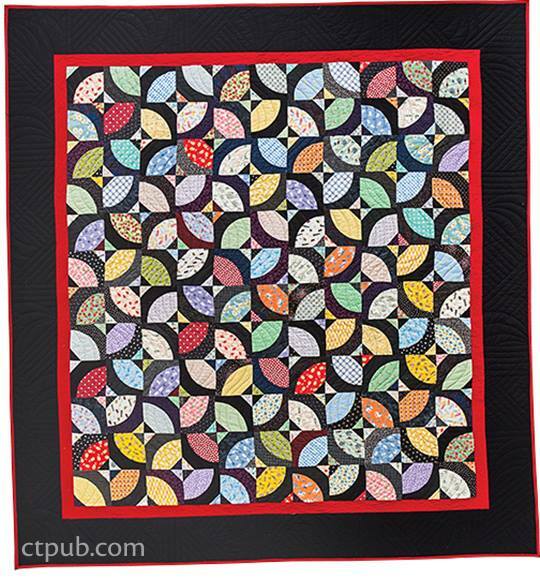 This quilt requires a Cutie Pack (16 fat eighths) and border/binding/backing fabrics. The color on the left (Noel) was the overwhelming favorite and looked great on this quilt. Stay tuned -- I plan to make many more Go With The Flow quilts! I was privileged to watch a sweet girl grow into a lovely young lady and now I'm even more privileged to help celebrate her expected twin baby boys! I made a quilt for this young lady when she graduated from high school. I don't have a photo of the exact quilt, but this LINK will take you to a similar one. Nearly 15 years later, she still lists this simple quilt as one of her most treasured belongings. When she got married, I knew she would never share that quilt with her husband so I made a quilt for them to share LINK. I am not convinced her husband has been allowed to use their wedding quilt, but that's between them! Now that babies will make four, I needed quilts for these sweet boys to grow up with. I found two perfect quilts hiding in my pattern sample stack and, for once, gave the presents in a timely manner! The expectant mom and dad loved the quilts, and these quilts couldn't possibly have a better home! Blessings to the happy family! 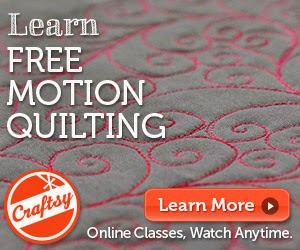 When you are quilting, do you ever have trouble seeing your stitching? I'm working on a quilt this week and it has some "hard to see the stitching" fabrics. The fabrics are LOVELY!! !, but difficult to see. Can you see the beautiful feathered wreath I'm quilting in that square using bright green thread? No? Side-lighting works! The next time you can't see your stitching, light your quilt from the side so that you can see the shadow of where the stitching is. Unknown Origins: Or, How Old is this UFO? I was saving this quilt top for someone special, and someone special has been on my heart a lot lately. I shopped the Quilt Basket sale a few weeks ago and bought some gorgeous backing/binding fabrics. I stitched Xs through the one-inch squares and feathers in the borders. Two patterns, alternating, make a really strong statement! I love this quilt. I love it a lot. I love that it might bring some comfort and joy to a special lady. A New Spin on Drunkard's Path Giveaway! John did an ah-ma-zing job with this book! I was tempted to treat this book as a work of fiction since it involves curved piecing (I'm a machine quilter, Jim, not a curved-piecer! ), but I trusted my friend John and decided to try a block using his instructions. I used Marti Michell's templates and discovered that my 28mm rotary cutter cut the curve the best. I can! I can sew curves!!!! Now I need to make this quilt for real. Leave a comment telling me what color scheme I should use (pastels, red, primitive, dots, etc.) 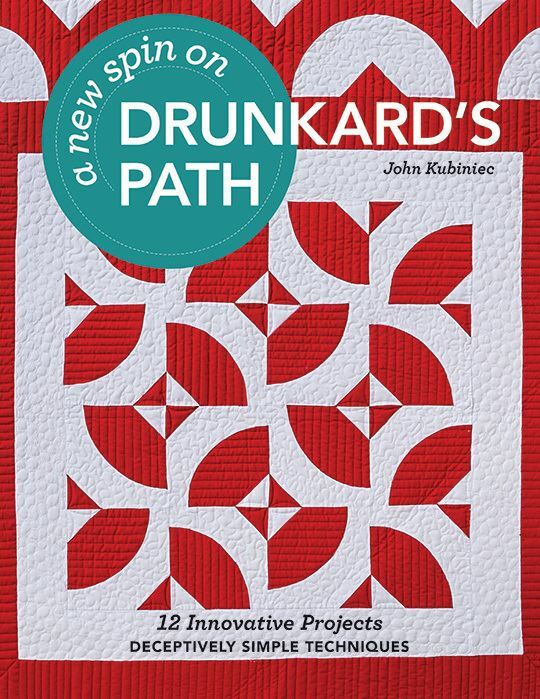 for my Bowtie Quilt and you'll be entered to receive a copy of John's book (e-book outside of the US) and a set of Marti Michell's Drunkard's Path templates. I'll draw a name after the blog hop ends and notify the winner! Hop around all of the blogs that are celebrating John's new book!